This year’s Festival is a celebration of fashion, design and film. It’s a chance to see creative work (anything from short films to dresses) inspired by our collections, and to get inspiration for your own creative project. From fanzines, fashion magazines to wildlife sounds and Russian postcards, the British Library collection is full of surprises. Highlights including a Fashion Flashback LATE and fashion show with a DJ set by Princess Julia, a Future Shorts film screening, a wildlife sounds animation competition launched in the London Film Festival, and encounters between Art and Science exhibition. They also have their Spring Market for the second year running and talks with BBC arts editor Will Gompertz, fashion illustrator Julie Verhoeven and GQ editor Dylan Jones. Book now or for more information go to the Spring Festival website. 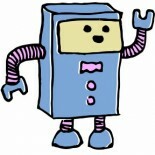 This entry was posted on 15/02/2013 by Creatabot in Creative and Art Events.